As seen in the opening scene of "Hunt for the wilderpeople". The rock at Tairua is rhyolite from the Kapowai Caldera, a volcanic complex that was active around 9 million years ago. It has steep, featured terrain with crack systems, pockets, edges, sloping bulges and chickenhead knobs in abundance. Some of the more featured rock resembles bubbles and there is the occasional hollow sounding flake, but the vast majority is good quality hard rock. Once further developed this will be a great crag to climb in the rain due to how steep it is. 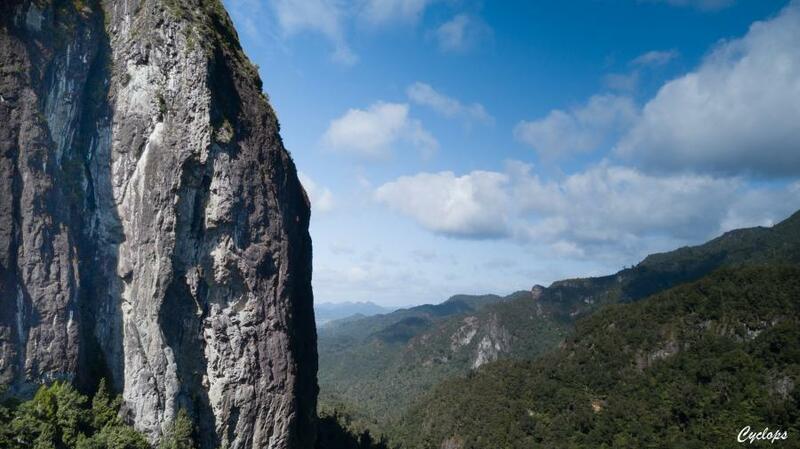 The Tairua crag is located in the Second Branch valley of the Tairua river, it sits at the intersections of Camp and Scots stream, within the southern sector of the Coromandel Forest Park. 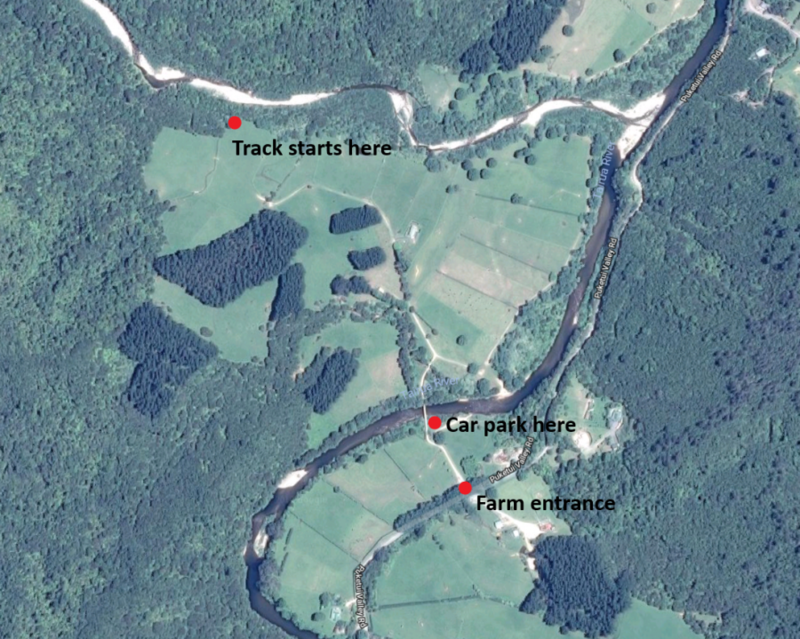 The track starts from a farm at 373 Puketui Valley Road. The owner is Gary Karl, and contact person is Claire Dall (Gary's sister). Please give Claire advance notice of your arrival by email at clairedall@xtra.co.nz (they do not have good phone reception). Let her know your name, how many people will be going in and how long you’re staying for. The farm road also goes past Colin and Natarsha Roycroft's house; please give Natarsha a text or phone call to let them know you will be coming through (particularly if you want to walk in at night). Natarsha's number is 027 903 8076. We are working on getting a sign and register installed so that we can eventually cut down on the number of notifications; please bear with us and notify both Claire and Natarsha in the meantime! You can Google Map your way to 373 Puketui Valley Road. Head to SH25A that runs between Kopu and Hikuai. Along this road there is a turn off opposite the Waitomo gas and service station onto Morrison Rd, with a sign reading “Community Hall.” Follow this for 1km, at the end of Morrison Rd is a bridge over the river, at which you turn onto Puketui Valley Rd. Follow this for 3.8km. You will have arrived at the farm when you see a cinderblock cattle station on your right. Climbers may park on the farm down by the river, just right of the first bridge. Do not drive over the bridges or across the farm. Please make sure your vehicle is not blocking the farm road. From the parking area, walk down the farm road over two bridges, past Natarsha and Colin's house and into a large field where the road ends, leaving all gates as you found them. The start of the track is on the far right side of the field. 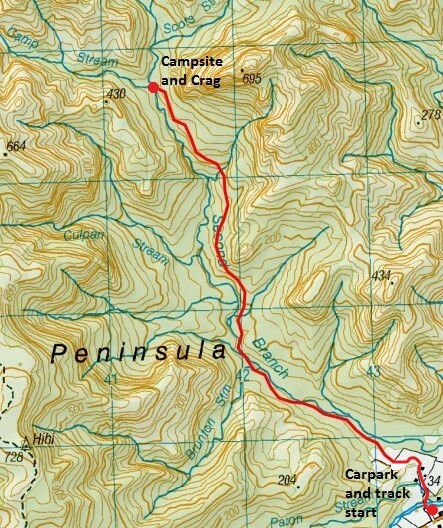 The track is an old kauri logging route that goes up the valley, beginning from the marked location in the farm. It begins as a quad bike track, but quickly turns into a partially landscaped bush track, before becoming a less visible pathway through the otherwise dense forest. The track has been marked with pink tape, has a handful old pink DOC tags, and white tin tags nailed to occasional trees. About 30 minutes up the track there is one section where you need to follow the river bed for about hundred meters before crossing the river. The way across is marked by occasional cairns. This is an easy rock-hop in good weather or light rain but has been known to get pretty committing in the rain, take that into account if walking out in bad weather. Stick to the track to protect the environment. There is a big cairn and a sign when you get to the campground/crag turnoff. The campground is down by the river. Both large Waterfalls in the second branch of the Tairua have bolted rap stations at the top. Following the stream bed on the way out on a warm summer afternoon makes for a great wee stream-bash with a couple 10m abseils. A wildly overhanging, left-leaning hand crack. Rope stretcher - use a 70m rope or tie knots in your 60m and be careful. Located at the far left-hand side of the crag up the access ramp with a white fixed rope. Absolutely radical! Start up the block just left of the main crack, placing a good cam off the ground to protect the start moves. Span across to the main crack and then blast upwards. The crux is hand jams. Make sure you keep a #.5 and a #.75 camalot for the top section where the gear options get a bit limited. DBC belay. Rack: Single rack of wires and small cams, double rack of cams from #0.4 - #3, one #4. Hexes work great too! This line follows a giant crack/chimney up the left side of the large central gully which splits the buttress.The first two and a half pitches were climbed ground-up on trad, but there is now a couple of bolts at the crux on the first pitch. The last two and a half pitches are bolted. Every pitch of this route is worth doing in its own right... no boring bits! Note the hardest moves (3rd pitch) are on bolts. All anchors are bolted. Descent: The line is a very easy rappel. All pitches are less than 30m so it can be done with a single 60m rope. Every rap leads you directly down to the previous belay, except for the first anchor which is slightly right of the rap line but is easy to swing across to. Slabby lefthand rising traverse leads to a few tricky slopy side-pulls protected with one bolt. This establishes you in a corner/chimney system which you power up to the first belay. DBC belay. A lovely hand crack turns into a mildly overhanging off-width, this pitch is awesome, bring big cams (could even use a no. 6 Camalot! Note the thrutchy crux is run out ~8m if you do not have anything bigger than a #4 camalot. DBC belay. Continue up the corner system on good gear until it runs out and you hit bolts halfway up the pitch. Try to find a bit of a rest before you hit a challenging sport crux (hard 23). Mantle out to the belay. DBC belay. Follow the bolts up the shallow corner and then traverse right to the steep but juggy arete. Some small holds bring you back left to the belay on a bush ledge. DBC belay. Note there are a couple bolts missing on this pitch due to a lack of battery power! Soon to be corrected. Pure fun! Up the short wall with awesome features, mantle over onto a low-angle friction slab leading to the anchor a few metres below the bush line. DBC belay. Pitches 1-2: Edwin Sheppard, Greg Kolbe Mar 2015. Start up the overhanging blocky ground which is easier than it looks up to a slopy ledge. From there launch into the overhanging flaring groove (crux) which leads up to easier but run-out slabs to the chain belay. Climb up the obvious left leaning crack around the corner and up through a series of small caves to the bolted belay. A 60m rope just reaches the ground from here. Cranky moves off the deck to a couple of okay placements, then straight up the steep groove (crux). It actually helps if you know how to jam! Stay right after the ledge and cruise up easier ground toward the belay ledge. You'll want a #5 for the offwidthy bit at the end. The hard(ish) trad challenge. Start 5m right of Jam and climb the vague diagonal crack as it trends left to join Jam at the ledge. Powerful moves on good holds, this would climb like a gym route if you didn't have to stop to place extremely fiddly little bits of gear. Scoping this one on top rope is probably a good idea if you're not English. This is the Tairua classic! Accessible from lover's ledge. Climb easy honeycombed rock to the 2nd bolt, then power through the crux which consists of a series of good underclings with long reaches to small slopey edges. The rest of the route is delightful stemming up the steep corner to the large chickenhead visible from below. Can be done as one long pitch or two short pitches at 21/18. Must be rapped in 2 sections due to steepness. Start up the slabs broken by 2 small overhangs (cruxes). Then up the short headwall to a chain belay on sandy ledge (Lovers Ledge). 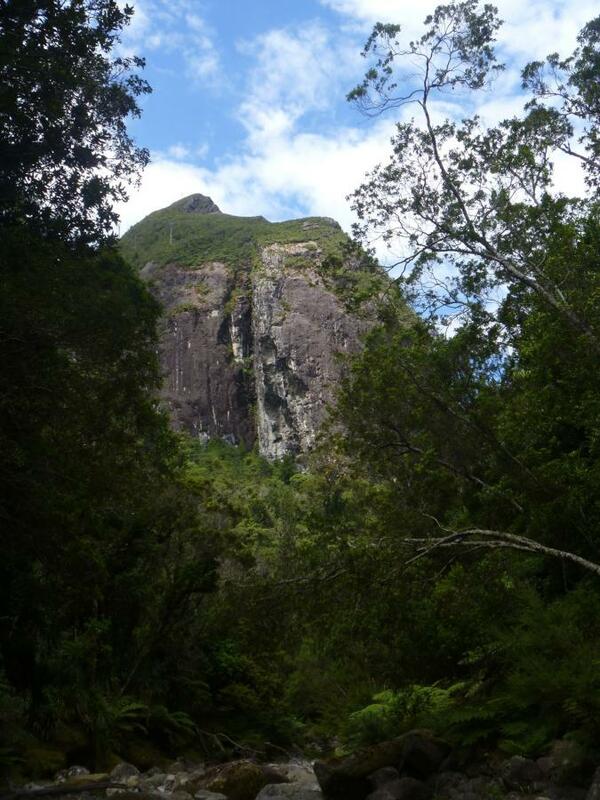 This route was the first route at Tairua and was climbed ground up on the first reccie to the crag. It has since been bolted in order to make it a friendly access route. Short but sweet. The line starts from a belay on the 'Alien Head' above Sandy Ledge. Climb Space Ape or Dirty Hairy Frenchmen to access the belay. A moderately technical first crux leads to a narrow bombay chimney. Jam a #4 or #5 camalot over your head and then squeeze, wiggle, grind and grunt your way through the luscious lips of an overhanging offwidth to a well-deserved rest. Make sure you keep a few medium cams for the top section and mind your rope doesn't get stuck in a groove as you descend. Awaits a clean ascent... open project! You will need a very special set of skills for this - suitable for caver/crack climber hybrids that like running it out on gear. This is a roof crack which is usually running with water but occasionally dries out in summer. Currently considered ungradable due to extreme quantities of dirt. Enjoy! Climbed (not clean) by Edwin Sheppard & Max Hutchinson, Feb 2017. Open proj. 2nd tier. Starts from the anchors at the top of Not Here to F*** Spiders (far right side of Lover's Ledge). Rad moves out right lead to a stiff crux sequence into a cave. Top out on the Living Room ledge. Max Hutchinson, Edwin Sheppard, Feb 2017. The blank overhanging arete to the right of "Are we tramping yet?" Starts on the block just left of Kapowai Calling, on the edge of the large gully that splits the face. Nice grade 17/18 moves up to the crux up the small crack at the top. Generously bolted to make for a comfortable lead. DBC belay. For an easier grade 18 variant, traverse up and right before the final steep section, past a single bolt, to join the first pitch anchors of Kapowai Calling. This variant is called Home is Calling. Start as for Home Again, before splitting off at half height following crack trending up and left. At the chocked block bust out left to flake feature before moving up to another chock (novel #4 camalot placement here). Sustained climbing follows with just enough gear to keep you going before joining Kapowai Calling at the bolt at the end of its second pitch. Recommended rack - wires, full set of cams to #4, doubles 0.3-1. Save the 0.75s to place after each chock. Sam Waetford (on pre-placed gear), Dec 2017. Awaits ground-up FA. Absolutely wild! Start at the same bolt as Coitus Interruptus but then trend right up the delicate slab before traversing right over ledges to the steeply overhung alien head feature. Take a deep breath before launching up the underside of this outrageous feature. Clip the green thread before you mantle out. DBC belay. A short, steep affair which is currently under development and needs another bolt. Probably 27. Starts from the anchors at the top of Are We Tramping Yet, and mantles out to join Space Monkeys. A few of the trad routes have been climbed and anchors bolted but they all still need a few pitches! So what has been climbed there ? Looks great!! !